How has TinnaRex helped others? How do I use TinnaRex? Tinnitus is usually caused by damage to the microscopic hairs that line the auditory cells in the ear. These hairs usually move in response to sound waves detected, producing a brainwave that is experienced as sound. When damaged, these hairs become bent or broken and move randomly in a constant state of irritation, producing “sound” impulses in the brain. Degenerative damage in people of advancing age is a common cause of tinnitus and usually paired with hearing loss. In younger sufferers exposure to loud noise is probably the leading culprit. Other causes of tinnitus may be as benign as a small plug of wax in the ear that is easily removed. Tinnitus may also occur as a result of head and neck injury, stiffening of the bones in the middle-ear or as a side-effect of prescription drugs. Sometimes tinnitus may be caused by an actual sound produced in your body that becomes audible due to disease or proximity to the ear (Objective tinnitus). Circulation problems such as high blood pressure and atherosclerosis can cause the sound of blood flow in vessels close to the ear to become more forceful, or turbulent - allowing your ear to detect the sound. Malformation or narrowing of blood vessels in the head and neck can have the same effect. More rarely, tinnitus is a symptom of a tumor in the head or neck. Conventional treatment of tinnitus is based on the underlying cause if one is found. For example, if impacted wax is the culprit, it is easily removed or, if a medication is causing the tinnitus, you would need to discontinue the medication or ask your health care provider to prescribe an alternative drug. In cases where tinnitus is caused by ear damage due to noise exposure or advancing age, very little is available in terms of medical treatment. Treatments that are available are generally used on a trial and error basis as different drugs may help different people. Avoid exposure to loud noises, which can damage the sensitive structures in the ear. Remember that maintaining overall health will benefit all systems – including the ear. Maintain healthy circulation with regular exercise and a balanced diet. Support the health of the nervous system, as well as the joints and muscles of the head. Be aware that certain medications can affect the ear and cause problems in balance and hearing – even causing tinnitus. Consult your doctor if you need advice. Smoking has a negative effect on circulation and cardiovascular health – quit smoking if you want to promote clear hearing! Use natural remedies to promote the health of the ear and all its structures. TinnaRex is a 100% safe and effective natural remedy for relieving tinnitus and addressing the various causes of this condition. Presented in convenient tincture form, regular use of TinnaRex helps to bring natural relief to people suffering from Tinnitus without the complications often associated with prescription drugs. Ginkgo biloba is an extremely effective herb used in Traditional Chinese Medicine and derived from one of the oldest trees on earth. Its medicinal properties have only been discovered by the West during the last 20 years, where clinical studies have indicated its effectiveness in restoring the functioning of the circulatory system and treating conditions caused by degenerative changes of ageing. Ginkgo is excellent for a number of cerebral and circulatory disorders. It is probably the most widely-used herb for tinnitus and many sufferers swear by this natural ingredient. Rosmarinus officinale (Rosemary) dilates and strengthens blood vessels and is an excellent circulation tonic. Rosemary is particularly useful for tinnitus that is caused or worsened by high blood pressure and other circulatory conditions. Rosemary also acts as an invigorating herb, relieving depression and imparting a zest for life, preventing fatigue and stress which both affect tinnitus. Avena sativa is made from the wild oat plant and is a well known restorative and nerve tonic. Avena sativa is effective in reducing high cholesterol levels which can contribute to circulatory problems which cause tinnitus. This herb is also used to treat depression, low libido and lack of energy. Recent studies have suggested that it is also effective in reducing the craving for nicotine in people who are trying to quit smoking. Verbena officinalis is also known as Vervain or Wild Hyssop and is native to the Mediterranean region. Verbena is well-known for its ability to relieve tension and stress and relieve mild depression. This herb is also useful in reducing pain and inflammation. Salicylic Ac. (30C) is a homeopathic remedy indicated for tinnitus with loud roaring or ringing sounds, which may be accompanied by deafness or vertigo. This remedy is particularly useful in people whose symptoms began with a bout of flu, Meniere’s disease or long-term use of aspirin. Because it is presented in homeopathic potency, Salicylic Ac. carries none of the negative side effects of pharmaceutical aspirin, yet offers excellent benefits. 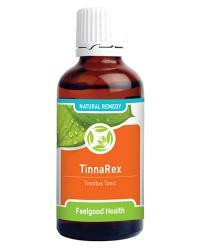 TinnaRex comes in a convenient tincture form and is available in 50 ml bottles. Chronic: 10 - 15 drops in 1/4 cup water or juice three times daily. Please consult your medical practitioner should symptoms persist. Safety during pregnancy and nursing not yet established. Do not use concurrently with Warfarin or other blood thinning medication. Relief is generally felt within minutes of taking TinnaRex, although stubborn cases may take a little more time to respond. Over a few weeks of using this natural remedy regularly, the sounds of tinnitus will be significantly reduced and heard much less frequently. Nearly 36 million Americans suffer from tinnitus and it is estimated that almost one in five people will experience tinnitus at some time in their life. Over seven million people have tinnitus so severe and resistant to treatment that it prevents them from leading a normal life. Can other people hear the noise of tinnitus? Although the noise of tinnitus can not usually be heard by others, in cases where it is caused by abnormalities of blood flow, your doctor may well be able to hear the noise - especially with a stethoscope. When you are busy during the day you may be more distracted by your daily activities and also the everyday sounds that surround you. At night, when your surroundings are quiet, the noise of tinnitus may become comparatively loud and constant. Tiredness and fatigue also tend to make tinnitus worse. When should I consult my health care practitioner? Tinnitus rarely indicates a dangerous condition and, apart from the annoyance and detrimental effects on your lifestyle, is not harmful in itself. However, if tinnitus is persistent, worsens over time or is associated with hearing loss or dizziness, it is important to consult your health care provider. Avoid any prolonged exposure to loud music and noise. Substances that are known to have negative effects on tinnitus include nicotine, caffeine, tonic water, alcohol and aspirin. Try to reduce your intake of food, drinks and medications containing these substances. Prescription drugs such as anti-inflammatories, sedatives, antidepressants and antibiotics all have the potential to trigger tinnitus. Speak to your health care provider about an alternative treatment if you use any of these drugs regularly or see our range of natural remedies for a wide variety of conditions. As tinnitus is usually more noticeable in quiet surroundings, a competing sound provided by a “white noise” producer, music, a ticking clock or radio static at low volume may be useful in masking the noise. For people with hearing loss, a hearing aid may help tinnitus by amplifying outside sounds and making the tinnitus noise less noticeable. Stress and fatigue can both worsen the symptoms of tinnitus so try to get adequate rest and investigate methods of stress management that appeal to you, whether regular exercise and leisure activities or relaxation therapy. There are therapies available which train the brain to 'screen out' the sounds of tinnitus. Speak to an audiologist or your health practitioner for more information. Remedy to combat tinnitus plus long term insomnia support!